Click on the links under map to get more detailed directions and information. Take Sunrise Highway to the Station Rd. exit. At the traffic light head south on Station Rd. Continue south to Montauk Highway. Make a right on to Montauk Highway. At the next traffic light make a left on to North Dunton Ave. Go past Verne W. Critz Elementary and make a left at the first stop sign and follow the driveway back to Administration. Central Registration is located in this building. Student Support Services is located in this building. Take Sunrise Highway to the Station Rd. exit. At the traffic light head south on Station Rd. Continue past Montauk Highway and over the rail road tracks and take the first left onto Beaver Dam Rd. Stay on Beaver Dam and go past HS and across South Country Rd. Make first left onto Fireplace Neck Rd.. School is on right side of road. 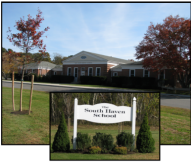 South Haven School is located on the south side of Montauk Highway just east of the intersection of Horseblock Rd. and Montauk Highway. It can be reached from Sunrise Highway by taking exit 57 and going south to Montauk Highway and making a left at light. Take Sunrise Highway to the Station Rd. exit. At the traffic light head south on Station Rd. Continue past Montauk Highway and over the rail road tracks and take the first left onto Beaver Dam Rd. Follow Beaver Dam Rd for approximately a mile. High School is on left. Take Sunrise Highway to the Station Rd. exit. At the traffic light head south on Station Rd. Continue past Montauk Highway and over the rail road tracks. Stay on Station Rd. and make a right at the next light which is Kreamer St.. The first school on right is Bellport MS.
Take Sunrise Highway to the Station Rd. exit. At the traffic light head south on Station Rd. Continue on Station Road to the first light which is Brookhaven Ave. Make a left onto Brookhaven Ave. The school will be on the left. Take Sunrise Highway to the Station Rd. exit. At the traffic light head south on Station Rd. Continue past Montauk Highway and over the rail road tracks. Stay on Station Rd. and make a right at the next light which is Kreamer St.. Kreamer Street Elementary is just past Bellport Middle School on right. Take Sunrise Highway to the Station Rd. exit. At the traffic light head south on Station Rd. Continue south to Montauk Highway. Make a right on to Montauk Highway. At the next traffic light make a left on to North Dunton Ave. School is on left just past first stop sign.